UPDATE: The suspect has been identified and arrested – details here. Police in Baltimore County are asking for the public’s help in identifying a commercial burglary suspect. 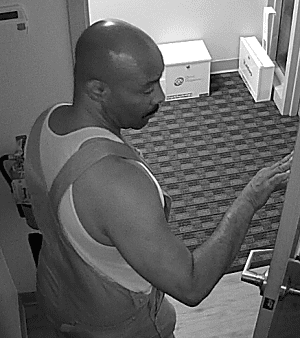 Since June this suspect has burglarized several businesses throughout Baltimore County, mainly within the White Marsh and Cockeysville precincts, including a nursing home, a construction company, medical offices, insurance company offices, and one elementary school. 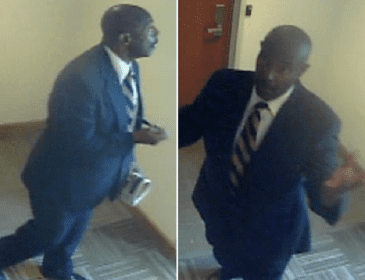 The suspect typically enters the business through an unsecured door and steals laptop computers and other small electronics. In two cases, he was caught on surveillance camera dressed in a suit, and wearing work coveralls in another case. Anyone who recognizes this suspect, or has any information on his crimes, is asked to contact police at 410-307-2020.